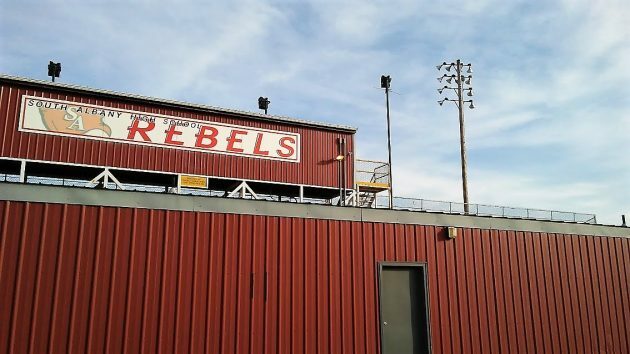 The press box at the Rebels’ football field, from the back, photographed in January 2017. I don’t envy whoever has to come up with a new name for the South Albany High School teams in various sports. As you know, the school has decided to abandon the Rebels label because of its baggage relating to the Confederacy. The students will get a chance to take part in whatever process is set up to come up with a replacement. It won’t be an easy job. You’d think that geography might offer possible names. South’s attendance area encompasses many natural and man-made features to inspire those charged with the task. One presumably safe alternative is to pick an animal, like one of those common in the vast fields southeast of town. But Eagles might be judged imperialistic in this hypersensitive age, and Sheep would be bad for teams that hope to win. Rams? Too gender-specific, no doubt. Nutria are common along the Albany-Santiam Canal, which runs through South territory. But Fighting Nutria is not likely to be anyone’s first choice. The South attendance zone is home to most if not all the area’s biggest retailers, from Fred Meyer to Walmart. So how about the South Shoppers? The former Southern Pacific and now Union Pacific main line forms the school zone’s western line. The teams could name themselves the Union Pacers or, harking back to history, simply the South Pacific. Selmet, the growing manufacturer east of I-5, is an expert in titanium castings. South teams could honor that expertise within their zone by calling themselves the Titaniums or Titans for short. The Freeway Lakes are not far away. But Lakers is not original enough. Remember the school is on Columbus Street. That is one connection that is probably useless. Even if Columbus was still revered, the South Albany Columbians would not sound quite right. I was in the last graduating class of Albany Union High in 1971. As I recall we were asked for suggestions at that time, and now, just as then, I believe that South Albany Sweathogs is the perfect name for that school! I really like the South Albany Titans … thank you Hasso! I never knew that Rebel was such a racist term. This really changed my perspective. Now when I read about rebel forces in a place like Syria, I know that they must be just a group of racists. As a graduate of South Albany in the 90s we did see some racist individuals. I can tell you they were not tolerated! The fact the school has the financial resources to fund this change will be remembered the next time the come to the votes asking for more money. It’s not really a racist term. Just a term for racist white southerns, but who wasn’t racist back then? Keeping your railroad theme…….Yard Goats. Just call the school “The South School” and leave it at that! What ever name the place gets saddled with someone is bound to complain, feel jilted, left out, etc.. I was caught up by the words South and Pacific. How about the Terrible Tongans or Marauding Maoris? Shoot, probably too racists. How about just sticking with the Southern theme and use The Fighting Crackers? Or The Grits? Dang, both would probably irritate someone. Guess I’ll just hush my mouth. How about the South Albany Copperheads? Or is there something not quite PC in this designation? Seems our culture is becoming more and more sensitive to any hint of political incorrectness. Maybe there is a true need for the “crying closets” that some schools are installing on campus. Southern Pacific Railroad, not South Pacific. Yes, obviously it was the Southern Pacific. Thanks. so much energy about a name. Waste of time. Spend $100m per year with poor academic performance at West and South. Oregon schools including our own do a lousy job of educating while changing names does nothing. So, you’ve pointed out an issue. How about a proposal that a plurality could back? Given Albany’s connection to Scotland (aka Alba), why not Scots or Highlanders? Both terms are gender neutral ( for the pc crowd). Describes a group noted as conservative with strong loyalty to home, family, and clan. Name should have been changed way back in 1990 at the same time that humongous confederate flag was removed from the gym wall and school logo was redesigned. Sorry so late with this. I just saw another article about the South Albany dilemma. This was about South Eugene. The Axemen. The article showed a young lady distance runner in “her” uniform. Name change! 90 years of the Axemen is gone. So, remember when they made generic beer? White can. Beer in black letters!? Problem solved. All sports have the word “TEAM” written on them. All uniforms, band, track, wrestling, etc, etc, etc are white with black. White t shirts with “TEAM” emblazoned in black. Go TEAM! Just a thought. The new name was supposed to be announced by May 21. Has anyone seen what the students selected?